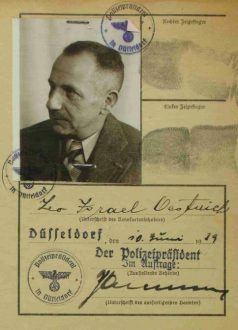 Apart from the sparse dates in his wedding record we don’t know much about Leo Oestreich, the cousin of Albert Tobias, who was deported from Berlin and killed in Auschwitz in October 1944. He was born on June 2, 1883 in Langstadt, Hesse, as the son of the cattle dealer Nathan Oestreich and his wife Guthal Steiermann. He was the youngest of six children. The roads of life of Albert and Leo crossed in Remscheid in 1914. Leo was registered here at Freiheitstr. 45 as a salesclerk. According to his nephew Max Oestreich he later worked as a floor manager at the department store Leonhard Tietz. Leo had a relationship with the saleswoman Alwine Rosalie Hilbertz and in August 1914 daughter Lieselotte was born. One month after on September 8, 1914, they got married. Albert Tobias moved to Remscheid in November 1914, close to his cousin’s place. He was a subtenant of the salesclerk Emil Schulz, who later ran his own clothing store at Freiheitstraße 45. It’s hard to say if Albert really lived and worked in Remscheid. At the latest in 1915, he went to war as a soldier and got married in Solingen-Wald in 1918, where he opened a men’s clothing store in 1920. Leo Oestreich probably lost his job at Tietz on March 31, 1933 and moved to Wuppertal. His last address in Remscheid was Scharffstr. 5. The marriage with Rosalie Hilbertz was divorced on September 26, 1942, at the district court of Düsseldorf. She stayed in Düsseldorf with her daughter, while Leo probably went into hiding in Berlin. Because of the divorce from his non-Jewish wife he was not protected anymore. We don’t know what lead to his detention in the fall of 1944. At the time the Gestapo still commited Jewish snitches in order to find the last Jews in their hidings. Furthermore it became more and more difficult to find a safe place because of the heavy bombings that struck the capital. On October 13, 1944 Leo Oestreich was deported from Berlin to Theresienstadt. 32 people belonged to that transport of whom 19 survived. Leo was immediately taken to Auschwitz where he was likely killed upon arrival on October 16, 1944.